Dark, mysterious ARGs are everywhere. Mystery elements make sense for the genre. It’s only logical that an overtly mysterious ARG campaign incites more natural intrigue and attract more participants than most other methods. Thus we see the cryptic messages, the non-descript websites, and other various, vague clues repeatedly utilized in most ARGs, especially in their early stages in search of players. The natural rise of this trend is simple enough to understand: a good mystery is an easy way to attract people. Often accompanied with the mystery elements of ARGs however, is a thematically dark narrative that seems overly-concerned with appearing as such throughout the game’s progression. 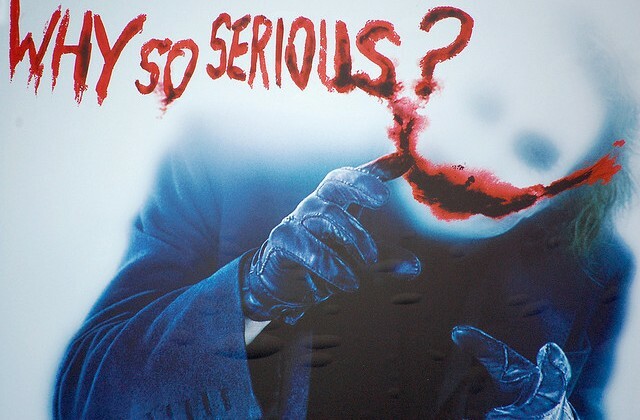 As noted in a now-dated 2007 article by Michael Andersen on the state of the genre, “‘Dark’ ARGs seem to be crawling out of the woodwork.” Sometimes these narratives tackle legitimately dark subject matter, such as “The Human Pet”, a YouTube-censored story of kidnapping and torture, others such as the Dark Knight “Why so Serious” campaign were less serious in subject matter, but still featured dark tones and imagery. A large majority of ARGs tend to follow a dark narrative or are created around pre-existing dark material such as Bioshock’s “Something Under the Sea” campaign simply because it is the way of the genre. There are numerous examples of ARGs that forgo this cliché, but there is no doubting the prevalence of dark-themed ARGs and their status as the stereotype of the genre. The stereotype is perfectly, succinctly assumed as such: “The concept is simple: put clues and hints scattered on fan sites, ads, or anywhere really, that will lead you to more clues. Eventually you will unravel a deep, dark mysterious story.” That’s the model used time and time again. Why is this? And why are the mysteries so dark? It feels as if every ARG begins mysteriously to engage an audience, but then can’t escape that vague, somewhat dark feeling the mystery creates once players have started playing. This is not necessarily the primary issue, however. Few ARGs actually walk in to dark territory without an initial intent to do so, and some even head in an opposite direction. The pronunciation book/Bear Sterns Bravo campaign, for example, began with highly, mysterious, cryptic YouTube videos, but resulted in a rather lighter-hearted, goofy sort of experience. The overwhelming majority of ARGs, however, are built from the ground up to be mysterious, highly dark narratives. Why is this? Is the trend based on precedent, or is our modern society naturally driven towards darker narratives? The 1999 Blair Witch Project greatly inspired modern ARGs through its presentation of the yarn-spun history of the horrific, murderous Blair Witch and the dark figure’s dealings in Burkittsville, Maryland. Despite the shock and scares the film incited, its audience was more enamored and intrigued than ever at discovering the truth and reality behind the nature of the film. The success of the Blair Witch Project and its accompanying online material has heavily inspired imitators to create a similar sense of fear and dread that crosses the boundaries of reality just the right amount to feel intriguing without being too frightening and off-putting. Other early ARGs such as “The Beast”, while not as overtly trenched in horror as the Blair Witch, borrowed its sense of mystery and dark themes. The question is: was it the success of the Blair Witch and other early like-ARGs or the craft of the style itself that spawned so many modern look-alikes in theme and tone? From a distanced perspective, modern ARGs appear to mindlessly replicate a standard process without looking for new creative avenues, opting to utilize the proven model in place. Cryptic message here, odd twitter account there, dark narrative in place= ARG. Obviously it isn’t that simple, and there is extensive creativity even within the bounds of the stereotypical mysterious, dark ARG, but for such a new field with so much room for possibility, it’s disheartening to see the genre falling into a series of basic expectations and components. The success of these early, dark ARGs certainly played a large role in influencing the modern state of the genre, but there is also no denying the genesis of the public’s natural pull towards dark ARG narratives. Part of our human nature greatly desires to feel something “real” outside of our normal, derivative lives. Dark, mysterious stories can break that barrier easier than most other genres and can feel authentic and close enough to reality that our minds, so willing and desiring to believe, fill in the gaps. This is the primary reason why ARGs have repeatedly turned back to the same sorts of trends. The basis for an ARG to work in any way is for it to incite some sense of reality in its players, a “real” game. The ARG is striving to fulfill a very powerful urge of human nature to be free and experience a feeling of reality without all of its consequences, more or less without real reality. We generally associate fun, fantastical stories with the distinctly not real. Dark stories, horror stories, command much more real emotion and feeling. Real fear is easier to reach than real fun. The reality of the horror story thus perfectly harmonized with the ARG’s desire to create a distinctly real-feeling experience. The marriage was destined to be. No doubt, in time, the general stereotype of modern ARGs will diminish, as new teams craft entirely new ways of commanding an audience. There are already numerous demonstrations. The Lizzie Bennet Diaries, for example, has little to no thematic, stylistic resemblance to the other ARGs discussed in this article and is arguably among the most successful ARG campaigns thus produced (at least from a critical perspective). The future will likely breed similar results that continues to move in to new territory, away from the current stereotype. The dark, mysterious ARG has proven to be an an avenue for amazing experiences that will likely continue to be produced even after coming to a peak, but it is not and should not be the sole ARG experience.